The financial health of the Archdiocese of Philadelphia continues to recover, despite a persistent though shrinking deficit. That is the outlook from the latest audited financial statements for the fiscal year ended June 30, 2014, which the archdiocese made public today, Nov. 6, along with an explanatory document. The statements, prepared by the archdiocese and audited by the accounting firm Grant Thornton, report on the Office for Financial Services, the central office managing most of the archdiocese’s finances. Archdiocesan entities such as Catholic Health Care Services, Catholic Social Services, Catholic education and others are not included in today’s statements but are expected to be completed and released in coming weeks. Two key metrics show progress has been made to reduce the high budget deficits from recent prior years. The reported deficit, referred to in the statement as the change in net assets, stood at $743,982 through June 30, 2014. 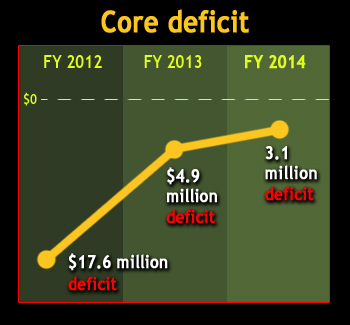 That is down significantly from the reported deficit of $39.2 million in fiscal year 2012. The sale of the archbishop’s City Line Avenue residence and sale of the priests’ retreat home in Ventnor, N.J., in 2012 led to a reported surplus of $3.9 million in fiscal 2013. But those were one-time transactions; in accounting terms, nonrecurring items. More revealing of the archdiocese’s financial health is the view of its core operations absent such nonrecurring items including legal and professional fees associated with recent transactions. The core operating deficit at June 30 stood at $3.1 million, down from $4.9 million in fiscal 2013 and $17.6 million in fiscal 2012. 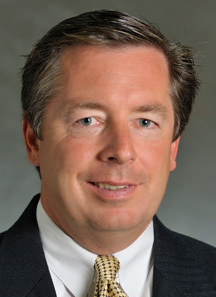 The archdiocese’s chief financial officer, Timothy O’Shaughnessy, is encouraged by the progress made since he was hired in 2012. “What I like about this (statement) is the number of nonrecurring items is fewer, the dollar value of (those) items is fewer,” he said. He described the current status of church finances as “stabilized relative to fiscal ‘12” and “moderated,” an improvement from the “catastrophic” deficit of $17 million in that fiscal year. The core operating deficit of $3.1 million “is something we have to deal with but from a cash basis we’re covering it with collection of prior amounts due,” he said. Collection of assessments from archdiocesan parishes stands at 94 percent, O’Shaughnessy said. The 219 parishes pay to the archdiocese an annual tax, or assessment, of 10.5 percent of their annual collections. Payment of past-due amounts from parishes is also aiding the recovery, he added. They are four long-term obligations that were very much underfunded in fiscal 2012 in the amount of $354 million. As of June 30 this year, that amount has dropped to $256 million. The Trust and Loan Fund, a kind of bank whereby parishes deposit cash and may receive loans for parish projects, had been underfunded by $82 million in fiscal 2012. Thanks to proceeds of $30 million from the lease of archdiocesan Catholic cemeteries, underfunding of Trust and Loan stands at $50.3 million. O’Shaughnessey expects that once the previously announced sales of the Don Guanella Village facility on Sproul Road in Springfield, Delaware County and Mary Immaculate Center in Northampton County are both completed — the former by early 2016 and the latter by early next year — Trust and Loan will be fully funded. Two other long-term underfunded obligations, the Risk Insurance Fund and Priests’ Pension Fund, also got a shot in the arm from the cemeteries’ transaction. Each received $11.6 million from the deal, bringing the underfunded amount down to $19.6 million for the insurance fund (from $30.4 million in fiscal 2012) and $80 million for the priests’ pension (from $90 million in 2012). The previously announced sale of the archdiocesan nursing homes to Center Management Group, which closed Monday, Nov. 3, should completely fund Risk Insurance and narrow greatly the remaining priest pension obligation, O’Shaughnessy said. The Lay Employees Retirement Plan remains underfunded at $107 million, and will take 20 to 30 years to fund entirely. But the plan’s $593 million in assets are thought to be sufficient for the plan’s $700 million in liabilities for retirees. The archdiocese made a major change to pensions for lay church workers when it froze its traditional pension as of June 30 this year and switched to a 401k-style plan (called a 403b plan for non-profit organizations). That switch actually increases the “pension burden” for the archdiocese, O’Shaughnessy said, because instead of contributing 7.5 percent to the traditional pension plan as it did in fiscal 2014, the church is now contributing 9 percent in the current fiscal year: 4 percent to fund the frozen plan, 4.5 percent to the 403b plan and a half-percent for administrative expenses. Together with a cost-of-living raise for employees this year and other expenses, including costs for the new Neocatechumenal Way Seminary, O’Shaughnessy expects the financial statements for the fiscal year ending June 30, 2015 to show a core operational deficit somewhat higher than $3.1 million but lower than $5 million. He sees that as a manageable financial situation in the short term, and has hopes that a new Apostolic Impact Fund, implemented by Catholic Charities, will help reduce the deficit along with other plans in development. “Our plan to shore up the balance sheet is beginning to take hold,” O’Shaughnessy said. “Our actual deficit is ending up consistent with the level we’re budgeting. We’ve brought stability to that process, and to getting the books closed faster. “In terms of those big balance sheet issues, we’re starting to see some of these transactions close,” which in the future will help fund the shortfalls as planned, he said. He also emphasized that the transactions are only for those balance sheet issues, and not for day-to-day operations or for the needs of next year’s World Meeting of Families in Philadelphia.